Talk Turns To Getting Assad To Give Up His Chemical Weapons : The Two-Way Russia's foreign minister says he has told his Syrian counterpart that one way to head off a U.S. strike could be to hand over control of those weapons to international watchdogs. The Assad regime has reportedly welcomed the suggestion. The White House says any turnover has to be verifiable. Speaking at the White House, former Secretary of State Hillary Clinton said it would be "an important step" if Syria turned over its chemical weapons. But she said she hoped it would not turn into a delaying tactic or "another excuse for delay and obstruction." "I will continue to support President Obama's efforts and I hope Congress will as well," she said. White House deputy national security adviser Tony Blinken just told reporters that the Russian suggestion has been made in large part because of the pressure the U.S. is putting on Assad and that it's "important that we not take the pressure off." Also, said Blinken, "we would welcome Assad turning over his chemical weapons ... in a verifiable manner." The Associated Press reports that the State Department says the U.S. will take a "hard look" at the Russian proposal. Saying he welcomes "these ideas," U.N. Secretary-General Ban Ki-moon also says he is considering urging the Security Council to demand that Syria turn over its chemical weapons. "If Syria were to put its chemical weapons beyond use under international supervision clearly that would be a big step forward," British Prime Minister David Cameron told Parliament on Monday, Reuters reports. But he added that, "we have to be careful though to make sure this is not a distraction tactic to discuss something else rather than the problem on the table." Update at 11:40 a.m. ET. Syria "Welcomes" The Proposal. According to Reuters, the Syrian foreign minister has said Syria welcomes the suggestion that it put its chemical weapons under international control. Saying he hopes to "receive [a] fast and positive answer," Foreign Minister Sergey Lavrov said Monday that Russia believes a U.S. military strike on Syria can be averted if President Bashar Assad hands over control of his regime's chemical weapons to international monitors. 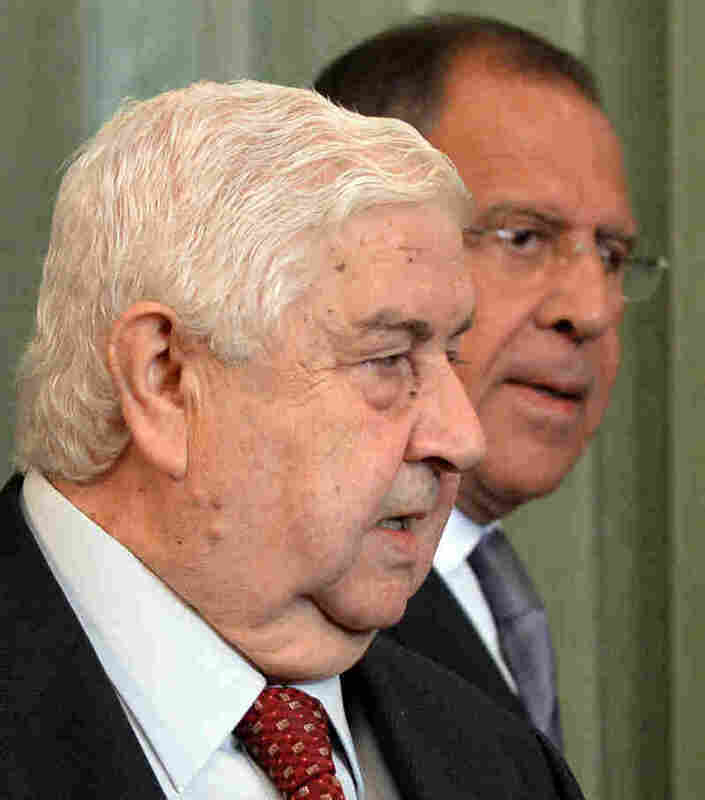 Lavrov said he made just such a suggestion in talks Monday with Syrian Foreign Minister Walid al-Moualem. The news from Moscow follows comments made earlier in the day by U.S. Secretary of State John Kerry, who said in London that Assad could head off strikes against his military assets if he turns over "every single bit" of his chemical weapons arsenal by the end of this week. But, as The Associated Press adds, Kerry also said he does not expect Assad to do that. Still, as the day went on there were some signs the idea was gaining momentum. United Nations Secretary-General Ban Ki-moon said he welcomed it. British Prime Minister David Cameron said that if Syria put its chemical weapons under international supervision it would be "a big step forward." The Syrian foreign minister reportedly welcomed the Russian suggestion. Shortly before 1:30 p.m. ET, The Associated Press reported that the State Department said the U.S. will take a "hard look" at the Russian proposal. Minutes later, White House deputy national security adviser Tony Blinken told reporters that the Russian suggestion has been made in large part because of the pressure the U.S. is putting on Assad and that it's "important that we not take the pressure off." He added that it would be welcome news if Assad turned over his weapons in a verifiable manner. The Obama administration says it has evidence that chemical weapons were used last month to kill more than 1,400 people in an attack near Damascus and that elements of the Assad regime were to blame. Assad has denied responsibility, most recently in an interview over the weekend with CBS News' Charlie Rose. A German newspaper reported Saturday that German intelligence services picked up communications indicating Assad "did not personally order last month's chemical weapons attack ... and blocked numerous requests from his military commanders to use chemical weapons against regime opponents in recent months." Syrian Foreign Minister Walid al-Moualem (left) and Russian Foreign Minister Sergey Lavrov in Moscow on Monday. President Obama will have more to say about his administration's case during interviews with U.S. news networks Monday afternoon. He's also due to address the nation Tuesday at 9 p.m. ET. The president and his aides have been pushing for support from Congress and the international community for strikes aimed at military targets inside Syria. If there's no military response, Assad will use chemical weapons "again and again and again and it's only a matter of time before [they] fall into the hands of non-state actors" such as al-Qaida, U.S. Ambassador to the United Nations Samantha Power told NPR on Monday. Many U.S. lawmakers, though, make the case that the crisis in Syria does not pose a national security threat to the U.S. and that many of the groups battling the Assad regime are linked to terrorist organizations or other enemies of the U.S.
Russia is a long-time supporter of the Assad regime, to which it sells weapons. Russia also has a naval base on Syria's Mediterranean Coast.